Doing a complete room overhaul for the dolls. It's a little hard to get inspired taking doll photos when everything is a mishmash of dolls all over the place...hence, the lack of activity around here and the ongoing process of reorganization in the doll room. Here's a sneak preview. 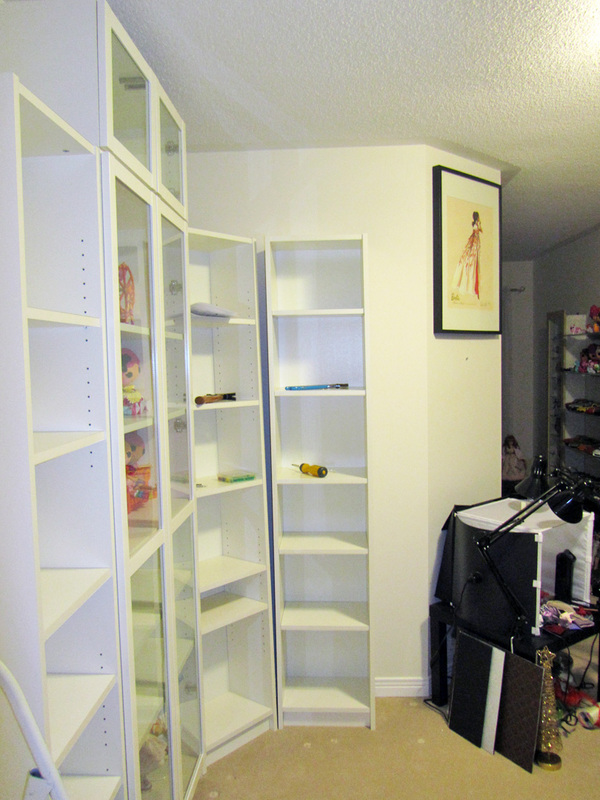 My partner and I have decided to add more shelving for future dolls and such. My Ikea Detolf glass curios remain, just moved against another wall. I've also finally gotten smart and thought of a way to squeeze in an actual desk for my photo box instead of having it on a low side table, with me crouched over every time I take pictures. I'll definitely take an "after" photo when this madness is over. For how this room looked like previously, check out Doll Epic on facebook HERE. This looks like it will be wonderful when you are finished, your white shelving will give the dolls great spaces. You are giving me ideas - my dolls are still all over the place. Sometimes I wonder what we did before IKEA came along ... I love that you can just keep adding on more shelving so easily. Looking forward to seeing your room finished.